TAMPA, Fla. – There are four college football programs that have yet to allow an individual 100-yard rusher this season. Marshall, which competes Thursday in the Bad Boy Mowers Gasparilla Bowl here against the South Florida Bulls, is one of them. Zero. Zip. Nada. No player has put triple-digit rushing yardage on the Thundering Herd, which ranks No. 10 nationally in rush defense (105.3 yards per game) and No. 6 in yards per carry allowed (2.98). USF has had eight individual 100-yard rushers this season. "The running backs are not ones you should sleep on," said Marshall senior linebacker Chase Hancock. Marshall's primary focus will be on Jordan Cronkrite, a 5-foot-11, 207-pound junior who tied a school record with five consecutive 100-yard rushing games earlier this season, and Johnny Ford, a 5-5, 168-pound freshman who has three 100-yard rushing efforts. Cronkrite leads the team with 1,095 rushing yards and nine touchdowns, and set a school record with 302 yards on the ground in a win against UMass on Oct. 6. Since his five-game run, Cronkrite has 235 rushing yards in five games, which is when the diminutive Ford has stepped into the spotlight. Ford has three 100-yard games in USF's last six, including 164 yards against UConn, 106 at Houston and 120 in the season finale against UCF. For the season, Ford has 737 rushing yards and eight touchdowns. It is a one-two punch that has the Herd's attention. "These two running backs are both guys that when you give them a little bit of a crease, they have a chance to go for 80," said Adam Fuller, Marshall's defensive coordinator. "That's always a problem. The run game is what you really get concerned about, and then you get the ball thrown over your head." Marshall has been one of the stingiest teams against the run this season, so Thursday night's ESPN matchup at Raymond James Stadium will be strength versus strength. 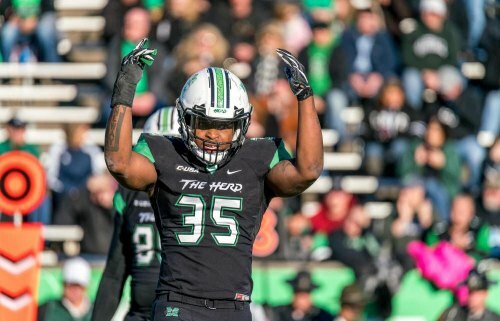 It took until the Herd's 11th game of the season – the team's Conference USA finale at FIU on Nov. 24 – for the defense to allow 150 team rushing yards to an opponent. Marshall was the last team nationally to not allow at least 150 rushing yards to an opponent. Also against FIU, Marshall allowed its first 30-yard rush of the season – the last FBS team to do so. Marshall is tied for fifth in fewest 20-yard rushes allowed (six), tied for first in fewest 30-yard rushes allowed (two) and tied for fourth in fewest 40-yard rushes allowed (one). Virginia Tech's Jalen Holston busted a 40-yard touchdown run with 4:56 left of the fourth quarter of the Hokies' win against the Herd on Dec. 1. That is the longest run surrendered by Fuller's defense this season. On the flip side, South Florida has had a knack for big plays on the ground. The Bulls' four longest plays from scrimmage this season have all come on runs: Cronkrite has three, including an 80-yard touchdown against ECU. Ford had a 78-yarder against UConn. USF is tied for fourth nationally in 60-plus yard plays with six, and tied for third nationally with four 70-yard plays. "The speed and the way they spread the field, it's a handful," Fuller said. Overall, USF has eight rushing plays longer than the long of 40 the Herd defense surrendered to Virginia Tech. As much as the Bulls will try to establish the run, Marshall linemen like senior defensive tackle Ryan Bee will be trying to corral the ball carriers before they can find open space. "The running backs are tremendous … they're 5-5 and 5-11, but they are quick, shifty guys and they'll be a challenge to get on the ground," Bee said.